Glackens began painting impressionistic beach scenes in 1908. He painted this canvas on Mahone Bay in Nova Scotia during the summer of 1910. The vibrancy of the work reflects Glackens’s close association with the American artists Alfred Maurer and Maurice Prendergast during this period, as he skillfully combined Maurer’s Fauvist-inspired color palette and Prendergast’s scenes of upper-class leisure. Glackens also drew inspiration from Pierre-Auguste Renoir and Claude Monet, most notably in his approach to painting water with short, quick brushstrokes that convey the effect of light and movement. Bathing Hour received little critical notice at the Armory Show compared to his monumental Family Group. An exception was the critic for The New York Evening Post, who found Glackens’s smaller canvas to be “much more satisfying, if not as courageous.” Bathing Hour was the only one of Glackens’s three paintings to travel to exhibition’s Chicago venue. 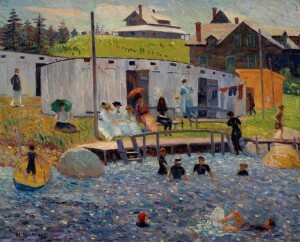 Bathing Hour was purchased from the artist in 1914 by Albert C. Barnes. Glackens and Barnes first met in the late 1880s at Central High School in Philadelphia and their friendship was rekindled in the twentieth century, and he assisted Barnes in assembling his renowned art collection. Barnes also purchased works by Glackens throughout his career and eventually amassed seventy-one of his paintings, pastels, sketches, and illustrations. “Seen in the World of Art: William Glackens Shows His Versatility,” The Sun (New York), December 18, 1910. This article is unsigned; however, the Glackens scholar Richard J. Wattenmaker notes that it was “certainly” written by James Huneker. Richard J. Wattenmaker, “William Glackens’s ‘Beach Scenes’ at Bellport,” Smithsonian Studies in American Art 2, no. 2 (Spring 1988): 92, n10. “International Art,” New York Evening Post, February 2, 1913, 5. Barnes purchased the work from the artist on April 1, 1914 for $500. See Richard J. Wattenmaker, American Paintings and Works on Paper in the Barnes Foundation (Merion, Pa.: Barnes Foundation, 2010), 81-82. Despite his role as chairman of the Domestic Committee, Glackens criticized the American section of the Armory Show in the issue of Arts & Decoration published to coincide with its opening. He stated that “skill in America is limited, limited by a lack of bravery…we have had no innovators here” and compared American art unfavorably to the contribution from Europe: “Everything worth while in our art is due to the influence of French art…I am afraid that the American section of this exhibition will seem very tame beside the foreign section.”  Glackens had three of his own works in the show: Family Group (1910-1911, National Gallery of Art, Washington, D.C.), The Bathing Hour (1910, Barnes Foundation, Philadelphia), and Sailboats and Sunlight (n.d., unknown location). Following the Armory Show, Glackens’s work began to show the influence of Henri Matisse in its intensified color palette. He continued to support the development of modern American art by serving as the president of the Society of Independent Artists in 1917, and by joining the American Painters, Sculptors, and Gravers (later renamed the New Society of Artists) in 1919. Milton Brown, The Story of the Armory Show, 2nd ed. (New York: Abbeville Press, 1988), 48-49, 83. Elizabeth Milroy, Painters of a New Century: The Eight & American Art (Milwaukee: Milwaukee Museum of Art, 1991), 87-91. William J. Glackens, “The American Section – The National Art – an Interview,” Arts & Decoration (March 1913): 159, 162.